It’s often said that looking back offers only a rosy-eyed view, but I think this Yuletide between-time also offers the clearest. 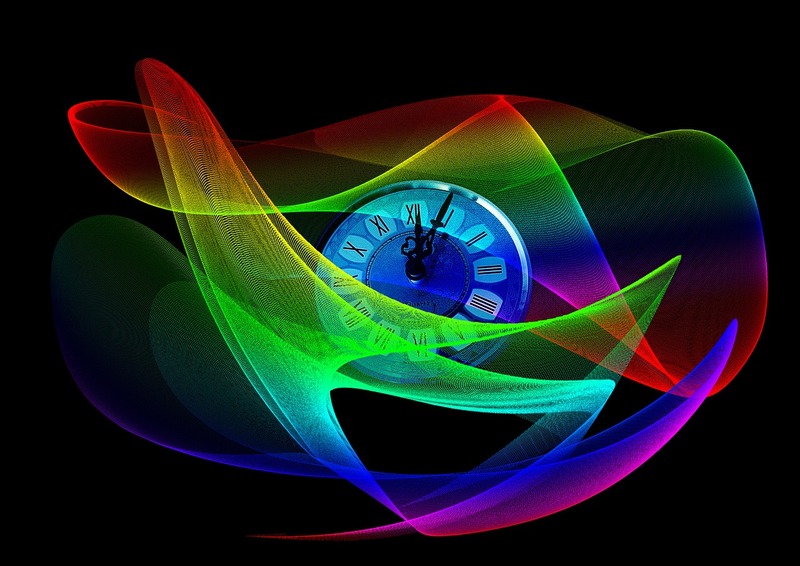 Ostensibly we’ve had a week off from our normal hamster-wheel activities – time for a laugh, general bonhomie, relaxation, and a needed deep breath. Assessing where we are comes easier. Over the past few years problems with my health grew to impinge on normal life and, for my writer side, disrupted my concentration. 2016 was one of physical rehabilitation which has gone well; my concentration is still under review. I’ve not done too badly. This blog has resumed its weekly posts, I’ve opened a YouTube channel for my video booktrailers, and added substantially to my work-in-progress, Pilgrims of the Pool, the last in the Torc of Moonlight trilogy. But I also discovered a hole in it – that concentration element – which should have been waving warning flags, or was waving warning flags that I failed to see. As a result one of its three storylines needs to be ripped out, re-planned and re-written, and the other storylines dovetailed into it. Such happens, but it needn’t have. So, high on my Resolutions for this coming year is re-cultivating my concentration, and that means going back to basics and re-learning good habits. I’m a list person, always have been as my memory has never been my outstanding asset. Have list + kitchen timer = better habits. At least that’s the plan. What’s your plan? And your best habit? In the meantime I have news! As part of bolstering my public presence – another of my New Year’s Resolutions – I am interviewed on AL Butcher’s Fantasy site Library of Erana talking about my novels, research, writing techniques in general, and the importance of editing. Join me across there, or back here next Saturday. Or if you’d prefer, add your email to the box in the column to have my posts delivered quietly to your Inbox. As I’ve found with the blogs I follow, it makes life so much easier. See you next week. 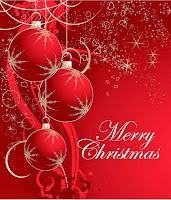 And may you enjoy a Happy & Successful New Year. 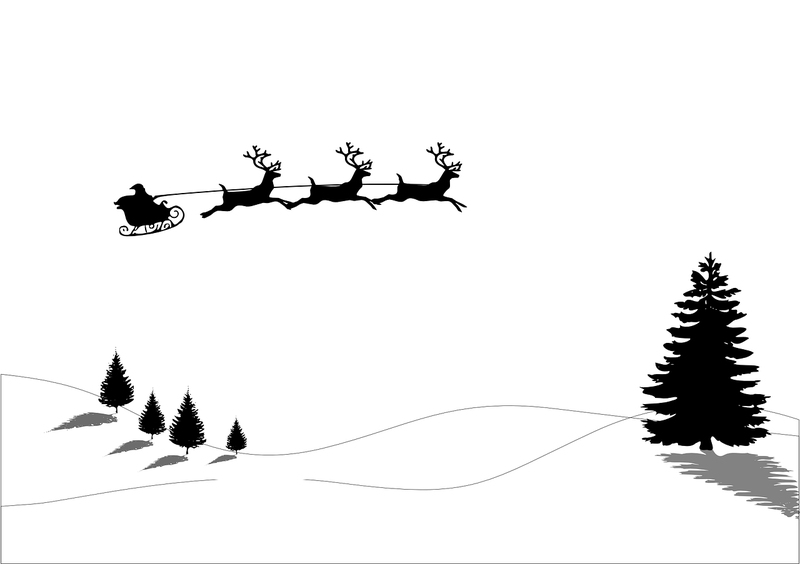 So... who will be dropping gifts at your hearth? Or is it you who will be leaving them? Here in the UK it is definitely Father Christmas who will be visiting, and despite his title he has nothing to do with Christianity, or parenthood, or even humans. It is the spirit of Mid-Winter, a personification clothed in evergreen, wrapped in holly and ivy, and garlanded in red berries and mistletoe. It is a jovial spirit, come to partake in the mid-winter’s frivolities. The people welcomed it with entertainment, plied it with food and alcoholic beverages, and gave offerings so that it might not linger too long but instead beat smooth a path for an early spring. So far so good. Enter Christianity and a need by the early church to leverage ‘Jesus the Christ’ against entrenched Paganism. No one knew Jesus’ birth date, so the Pope decided Jesus should be given one. The Pagan equinox celebrations of spring and autumn had already been coveted, so why not align the day to the biggest celebration of them all? A bishop from the Middle East, recently raised to sainthood for his good works, was also pressed into action: Nicholas (more or less). In the face of such worthiness the Brits remained steadfastedly wedded to their eat, drink and make merry. The Saxons and Jutes invaded, bringing along their Woden and winter’s Father Time. They also believed in eat, drink and make merry. A later invasion by the Norse and Danes (Vikings) – who also believed in eat, drink and make merry (can you see a pattern developing?) – brought along their Odin, who during mid-winter took on the manifestation of Jul – Yule – in that he was portly, white-bearded (signifying age), had the ability to see into people’s minds and know if they’d been good or not-so-good, and rode a horse, Sleipnir, which travelled at terrifying speed due to it having eight legs. Father Christmas as we know it was beginning to amalgamate. Saint Nicholas didn’t truly put in an appearance on British shores until the islands were invaded yet again, this time in 1066 by ex-Vikings, the Normans. 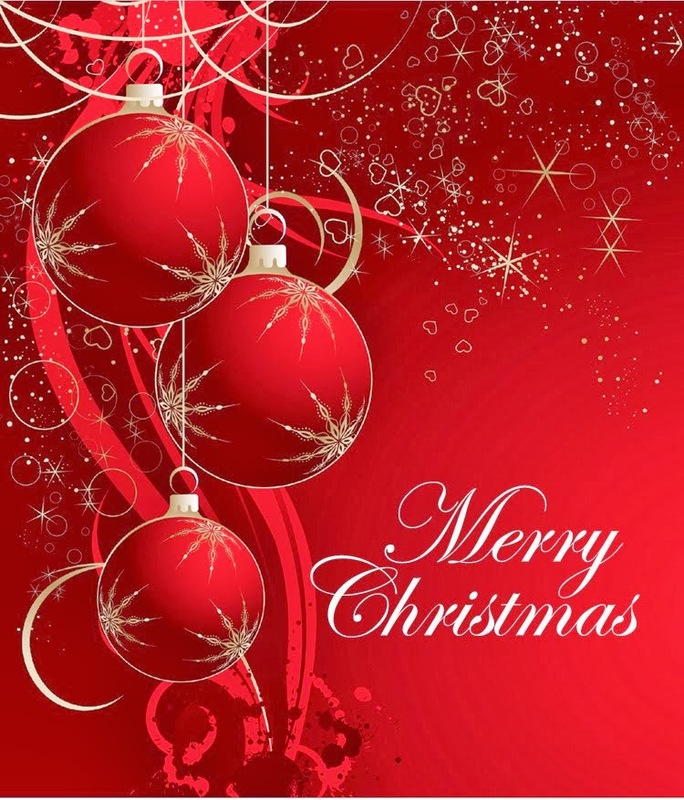 However, no matter how the populace was “encouraged” to be pious, once out of the church doors after celebrating Jesus’ birthday, eat, drink and make merry remained the national stance. Not even the Puritans, who in the mid-17th century took the field and the country during the English Civil War, could fully ban Christmastide – ie the eat, drink and make merry – and Father Christmas, as he was by then known, made appearances in Mummer’s Plays, basically to raise a glass [ie two fingers] to the Puritan Parliament. And what happened to the Puritans? We sent them to America (more or less). Wherever you are, and whatever spirit of Nature you believe in, be sure to eat, drink and make merry! Christmas is a time for giving gifts in many forms. One is via charitable works. Readers of this blog may have noticed that I belong to a Science Fiction & Fantasy promotions group, and a couple of my titles have benefited from the group's helping hands. Now is the time to pay it forward. 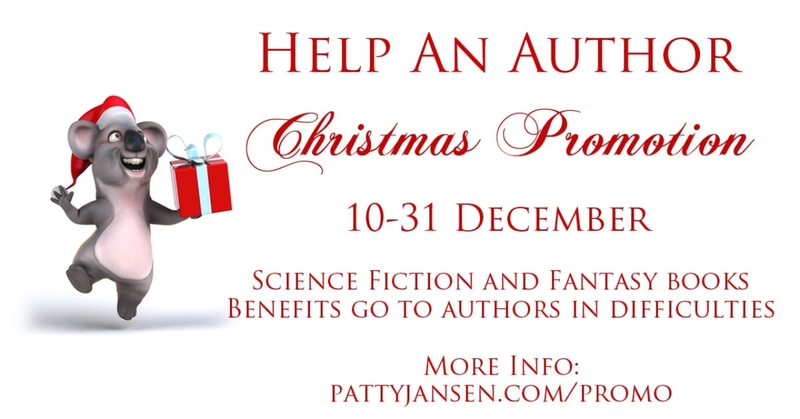 Patty Jansen, the group's indefatigable co-ordinator, is organising a book promotion to benefit authors in the genres who are finding life more difficult than they should [been there, done that]. Each participating author has dropped something in the pot and, with added donations from book buyers, already six packages of $250 have winged their way to deserving recipients. You don't have to donate. You don't have to buy an ebook. But you might want to take a look. Just follow the link on Patty's name above. Many thanks from the group. On my quest for book trailers for some of my novels, I took advantage of an offer made by the organisers of the mini litfest at FantastiCon held recently. The novels didn't have to be SciFi/F so I opted for my Native American historical Beneath The Shining Mountains. I did not discover the identity of the trailer's creator, but the requirements seem more or less universal. It was seen with others in a loop playing at the Con, which was the first time I saw it. Now it's all mine. What do you reckon? I think it turned out rather well. For more info on the novel and a full set of buying links, visit The Historicals page. Next year's FantastiCon, to be held during Hull's City of Culture 2017, is scheduled for the weekend of 02-03 September. Free SciFi & Fantasy #eBooks! Yes, it's promo time again. This is a joint Freebie promotion for this weekend only - 3 & 4 December. 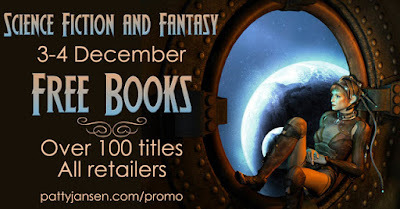 Fantasy, Science Fiction and Horror titles are up for grabs, as is SF/F Romance, from short stories to novels to whole collections. So fill those winter wellies and try out new authors who otherwise might not pass before your eyes. 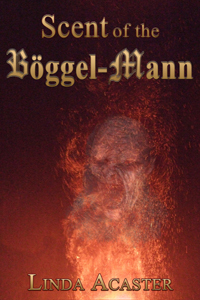 My offered free title is Scent of the Böggel-Mann – alas Amazon won’t allow me to offer the title for free for the Kindle, so to get it you’ll need to download from Smashwords and choose the “mobi” format. Those who read via Nook, Kobo or iBooks can download direct. This dark fantasy is set very much in the present day, and if you didn't catch its trailer, you can watch it HERE "European folklore come to the UK..."
Do I take my own advice? Of course I do. Mine are already in the bag. Or at least my Kindle. Happy reading!